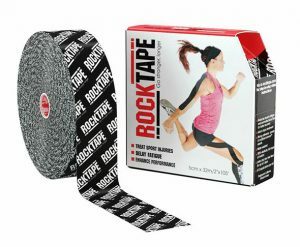 Unlike rigid tape which is stiff and restrictive, effectively decreasing the range of motion of a joint, as well as effecting the motion of the joint above and below, Rocktape with its unique elastic properties provides functional support while allowing normal movement. When applied over a stretch muscle, Rocktape lifts the skin, accelerating blood flow to increase the amount of oxygen available, which reduces fatigue. It also promotes lymphatic flow to remove toxins and waste products produced by the body. It can be used to both prevent and treat injuries and pain. They are made outside of Korea. Korea is where the original and best kinesiology tape is made. The weave of tape is poorly made and finished thus effecting the elastic properties and qualities which is the main concept of kinesiology tape in the first place. The adhesive glue is potentially toxic and low grade, causing it to come off easily and more often, resulting in more tape being used and costing more in the long run.